Where do I begin? This marathon and family vacation was very special to us as we had the opportunity to take the whole family with us on this journey. In addition to visiting Africa we had the opportunity to visit London and Paris on this trip. It was definitely an exhausting trip but one that we will always cherish! There are so many memories about this trip that I am just going to touch on a few of them here and save the rest for our book! This trip was all about engaging family and focusing everyone on a common goal while having a great time together! So why did we decide to take the family? We wanted our children to have the opportunity to visit Paris where we were married (you can view our marriage video on the blog) as we did not have them present at our wedding! Since we were making this long trip we decided to get in as many countries as possible and therefore decided to visit London (This was a first for David and I together as well). We visited London first and had the opportunity to visit all of the key sites including the Tower of London. The girls took a day and went shopping while the boys hung out in the bars watching the soccer matches. At the end of the day we ended up together in a Hare Krishna Parade-not sure how this happened but you can only imagine after a few beers or three! 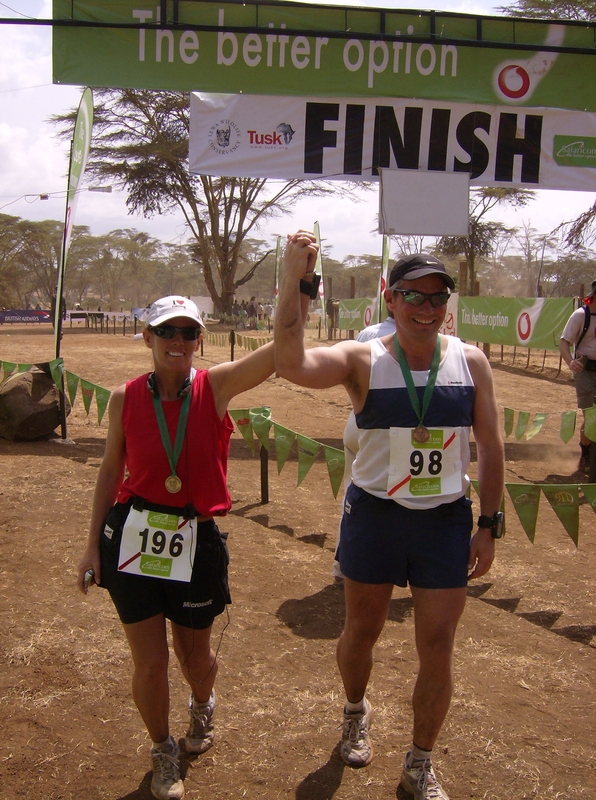 We then traveled from London to Kenya and had the opportunity to some safaris prior to the marathon. You can hear more about these stories in our upcoming book! Lastly, on the way home we visited Paris and had the opportunity to visit the Eiffel Tower, Arc De Triomphe, Notre Dame and of course shopping at Champs- Elysees!! 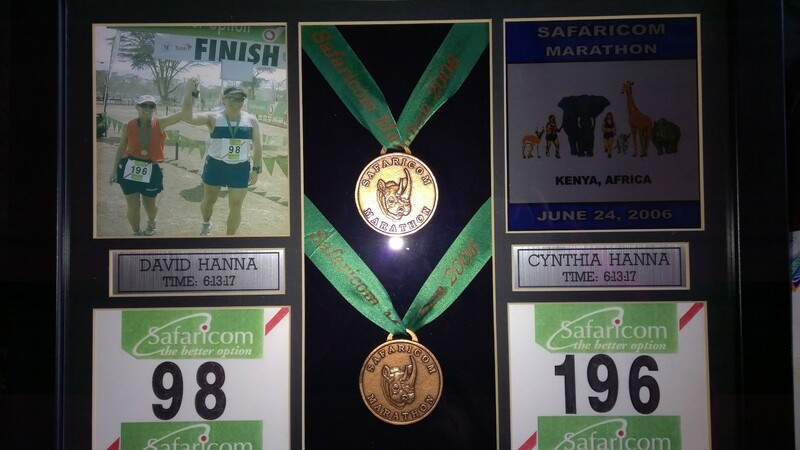 The Safaricom Marathon was the toughest Marathon for us to date. The heat coupled with the altitude and hills made this a huge challenge. The views along the course were breathtaking! This was the first race that we ran where there really weren’t spectators on the course (due to the risks associated with having this in the game park). The Kenyan’s were the kindest people and were very hospitable to all of us! The course was a two mile loop and we actually finished the first half in good timing but really began to feel the heat around mile 14. There was basically no shade during this 26.2 mile run except for at the end (for about 1/4 mile) and during the second time around it was very desolate. Sometimes you wondered if anyone was even watching over us. . In addition to the heat, hills and altitude, we had to worry about the four legged animals that at any time could embark on our path and pose a danger to any one of us! The course was patrolled by a spotter plane and helicopter as well as a large and experienced team of armed rangers to tranquilize the animals in case they threatened the runners (A giraffe crossed the running path in front of us. At one point both the rangers and sharp shooters removed an elephant away from the running path to protect us). Again, the first 13 miles we did not feel threatened. However, the last 13 was a little scary as it seemed as though we did not see the helicopters as much or the rangers. This could have been our imagination as we were quite exhausted and felt pretty lonely out there. The Kenyans had already finished (yes, they lapped us) and were packing up and heading home. So mainly it was just our group from the US that remained on the trail during the middle of the day and I have never seen so much commadre from other runners in the US that we did not know. We all realized we were in the same situation and supported each other as much as we could! We finished…and that is all that counts!!! – The poverty stricken country- we don’t realize how fortunate we are! – Collin asking if there was a television in the game park so that he could watch the championship games. – Not such a great memory…getting very sick two days before the marathon. Basically, depleting our bodies of everything we had consumed over the last week. Worrying about having enough in us to finish a marathon. -Worrying about Mitch as he was very sick in the game park- wondering if we were going to have to helicopter him out of there! The care that the Kenyans gave Mitch was amazing. They were constantly checking on him to make sure he was ok. Unfortunately, he was unable to run the marathon as he was down in bed the day of the race. We all had him in our thoughts when we were running and realized that we had nothing to complain about! Couldn’t wait to get back to make sure he was ok. It was so hard having to leave him on race day!! -Seeing the children walking to school (3 miles) through a game park. Pretty scary…but they are used to it! -Seeing all of the animals in their natural environments (Lions with cubs, three cheetah brothers, elephants, monkeys, water buffalo, giraffes, zebras and others….how Amazing! -All the animals right outside of our tents…and the noises they made at night (animals fighting). -How cold it really was. I thought it was supposed to be hot in Africa…it was actually pretty cold (except for race day-of course). We had heated water bottles in our beds at night to keep us warm! – The dark night skys…no lights…no electricity at night…more stars then we have ever seen before…..pretty scary..but very serene. -The Kenyans…how amazingly fast they were! No wonder they win all the races in the U.S… they train in unbelievable conditions! -Completing a Marathon with family!!!! – Just Plain enjoying special time with family and making so many memories!!! !